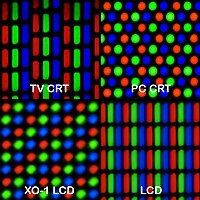 Geometry of color elements of various CRT and LCD displays; phosphor dots in a color CRT display (top row) bear no relation to pixels or subpixels. Foley, James D.; Andries van Dam, John F. Hughes, Steven K. Feiner (1990). "Spatial-partitioning representations; Surface detail". Computer Graphics: Principles and Practice. The Systems Programming Series. Addison-Wesley. ISBN 0-201-12110-7. "These cells are often called voxels (volume elements), in analogy to pixels." Pixels and Me: Video of a history talk at the Computer History Museum. Square and non-Square Pixels: Technical info on pixel aspect ratios of modern video standards (480i,576i,1080i,720p), plus software implications. หน้านี้แก้ไขล่าสุดเมื่อวันที่ 6 มิถุนายน 2560 เวลา 13:40 น.